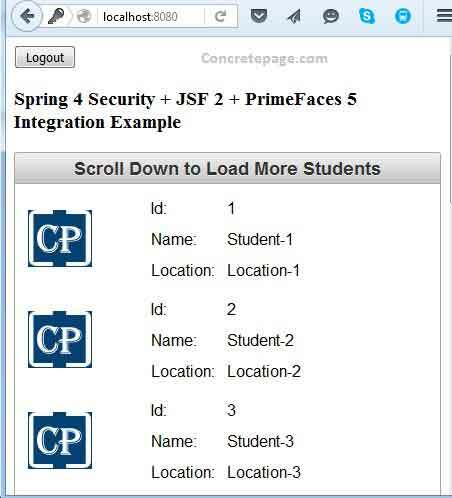 On this page we will provide spring 4 security, JSF 2 and primefaces 5 integration annotation example. We will create a custom login page using HTML form. After successful authentication, a UI created in primefaces will open. Data is served by JSF managed bean and security is handled by spring security module. In our application we are using CSRF protection and for that we have included CSRF parameter within form in our pages. 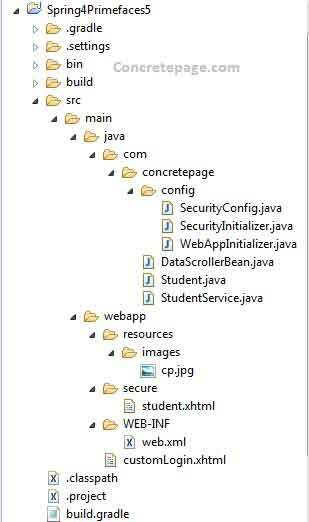 We are using JavaConfig for spring security configurations. User authentication will be done using in-memory authentication. We will discuss here integration step by step. Find the gradle to resolve the JAR dependencies and build the project. Find the JavaConfig used for spring 4 security. configure(HttpSecurity http) : Override this method to configure HttpSecurity. Here we configure custom login page, URL to validate username and password, logout URL etc. configureGlobal(AuthenticationManagerBuilder auth) : Using AuthenticationManagerBuilder here we will perform in-memory authentication by creating a user with a role. Now we will create a custom login page. Login form will be a simple HTML form. We need to include CSRF parameter using hidden HTML field. Form must be submitted as POST. Now we will create JSF managed bean. Here we are using JSF annotations. @ManagedBean : This annotation enables the class to be registered as managed bean with runtime. Managed bean classes are scanned at application startup time before serving any request. @ViewScoped : This annotation enables the managed bean to be considered as view element for the runtime. @ManagedProperty: It is used to inject the value into the property. @PostConstruct: It instructs the method to be executed only after dependency injection is done. In web.xml we will configure FacesServlet which is responsible to manage web request lifecycle of the application which UI has been created using JSF. This is a sample UI which is using primefaces. Tabulated data of students will be shown here. We are using primefaces dataScroller that loads more data on scroll down of the page. Find the class that registers DelegatingFilterProxy. Find the class that registers DispatcherServlet. 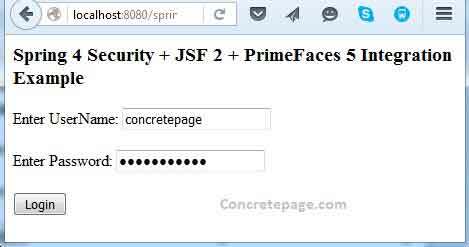 Enter username/password as concretepage/concrete123 and we will get below UI. When we click on logout, it goes to login page.